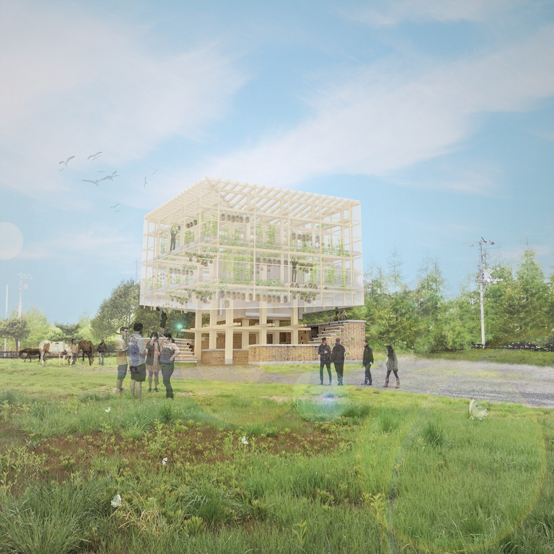 On April 25th 2014, at the final screening of the 4th LIXIL International University Architectural Competition in Tokyo, the team from the CED won top honors for their proposal, Nest We Grow . 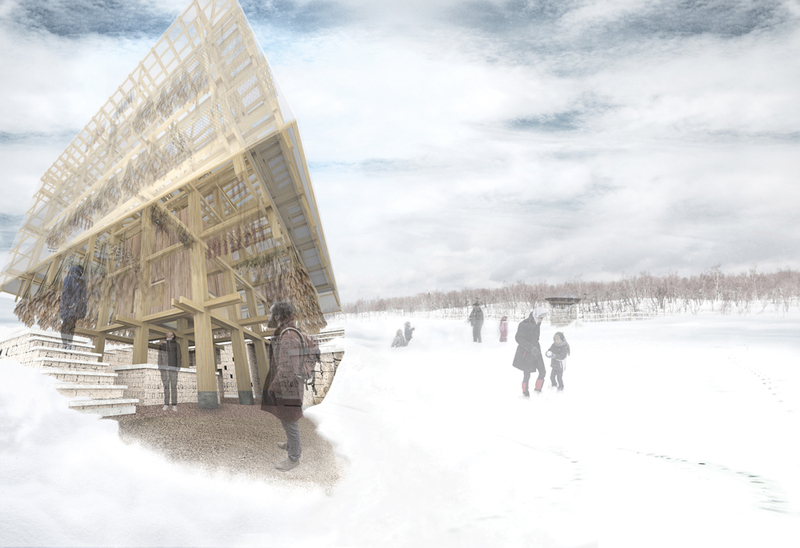 The project will be built in November 2014 at Memu Meadows in Taiki-cho, Hakkaido, Japan. Below, the student team reflects on their experience. 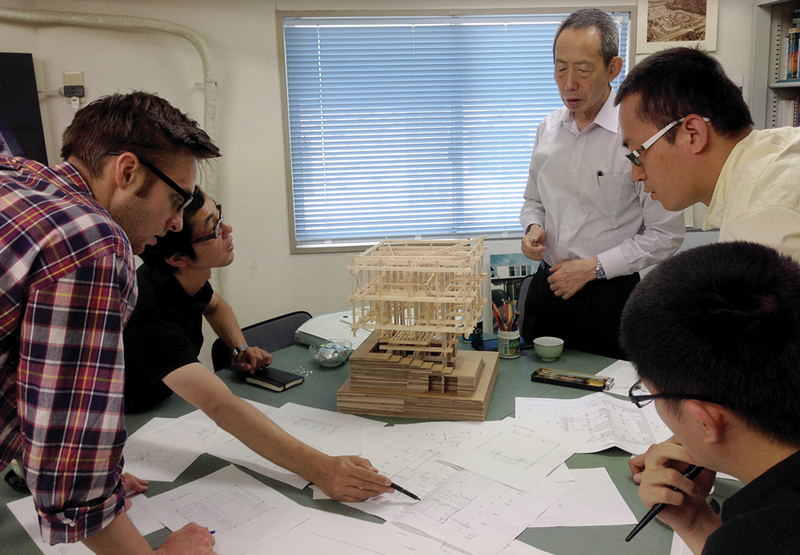 This past summer we traveled as a team to Tokyo, Japan to complete our design and start construction for our winning competition proposal, Nest We Grow . Earlier this year under the leadership of Hsiu-Wei Chang, a recent graduate of CED, and Professors Dana Buntrock and Mark Anderson, we developed a concept and design that we submitted to the LIXIL International University Architectural Competition. 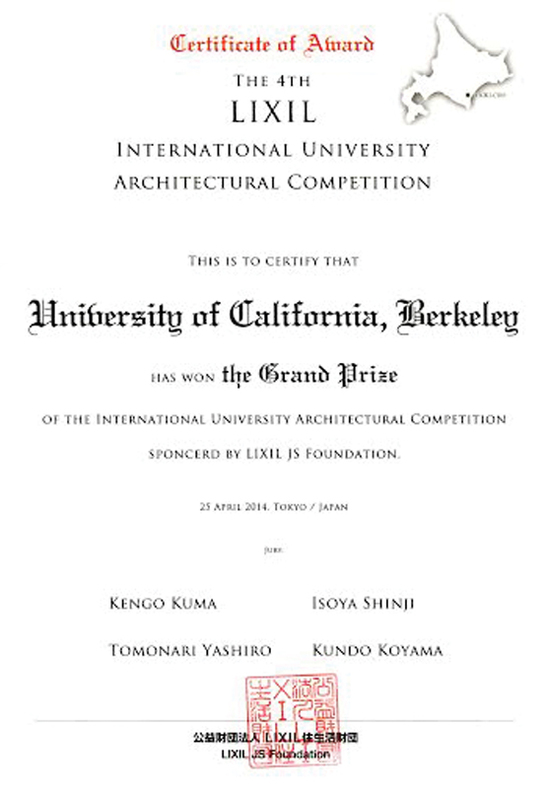 The competition, now in its 4th year, is held annually by LIXIL, a Japanese firm known internationally for its expertise in the built environment. Established by LIXIL JS Foundation, the competition strives to inspire next-generation sustainable architectural solutions by inviting universities from around the world to submit designs in response a unique theme. This year’s theme, Productive Garden — A Space for Enjoying Hokkaido with All Five Senses , solicited proposals from UC Berkeley, along with 11 other universities from a total of 9 countries. 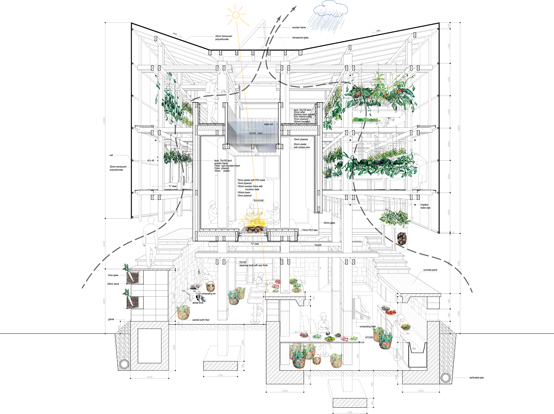 Our team’s proposed design, Nest We Grow , creates a holistic garden capable of connecting members of the community with the cyclical nature of food. We achieved this by designing spaces in the Nest to pragmatically respond to each element of the cycle, from planting, growing, harvesting, cooking and dining, to composting, which restarts the cycle. Using a 3 dimensional wood frame for the main structure we incorporated all of these elements into our Nest and created a productive garden typology. The Nest is capable of being replicated in size or scale and in many different contexts but with the same goal, to bring people closer to the production, consumption and decomposition of food. We were honored that the completion jury awarded first place to Nest We Grow . This set the stage for our summer in Japan where we became responsible for the project from the design phase to completion. In order to do so we worked closely with project architect Takumi Saikawa, of Kengo Kuma and Associates, and Masato Araya of Oak Structural Design Office. With their help and expertise, along with many others, we were able to take our idealized vision of the Nest and turn it into a reality. 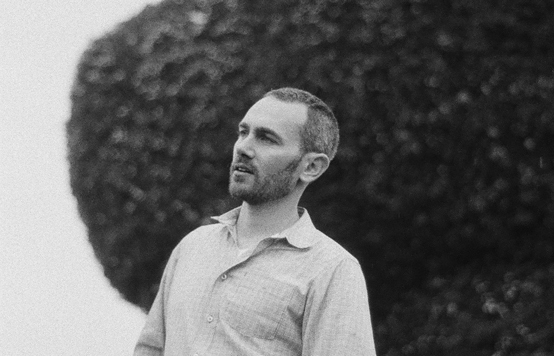 Through the period of intense design leading up to the construction of the Nest we learned two very important lessons that we will carry with us into our design careers. First, work in the built environment needs to be done with a considerable amount of cooperation across many different professions, including structural engineers and contractors, and in our case a composting toilet manufacturer. These discussions each require a different set of tools, ranging from drawings to languages, and are critical to a successful project. The second major lesson is having the ability to re-design or re-purpose a part of the design in order to meet the requirements of these discussions, and to do so quickly enough to keep the project moving towards completion. During our schematic design phase, we focused on how to approach and develop the concept through architectural language.  However, when it came time to move into the construction design phase, we switched our focus to meet the demands of the budget, the construction methods, and deadlines, in order to maintain the desired building function. In several cases the concept was reevaluated in order to meet these new demands, allowing for unique solutions that were not at first considered. This competition is an incredible opportunity for any group of young designers, and with the construction phase now under way we look forward to seeing the completion of the Nest, and to future enhancements in the years to come.